* The Ladies of Llangollen. 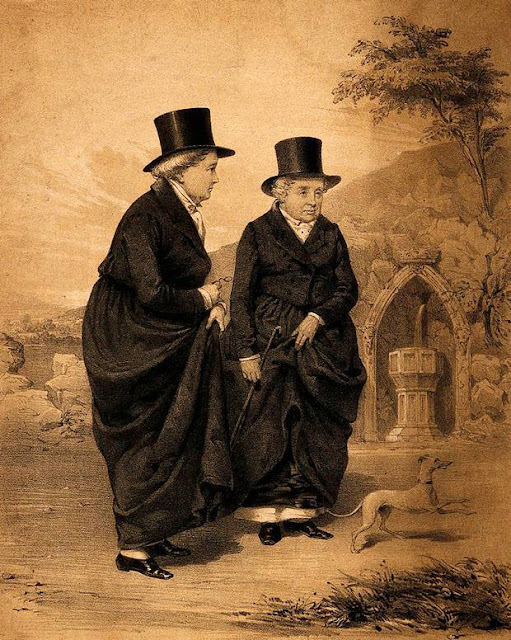 A newspaper article says the Ladies of Llangollen became Ireland’s “first known lesbian couple” years before it was decriminalised. The precise relationship of the two women who fled from their homes in British-ruled Ireland in the late 18th century to famously set up home at Plas Newydd has long been the subject of debate. Many claim Lady Eleanor Butler and Sarah Ponsonby were like-minded friends while others believe they were linked romantically. However, a story in Ireland’s Sunday Independent last weekend describes their status in very definite terms. The story says: “Two Irish aristocratic ladies known as the ‘two most celebrated virgins in Europe’ became Ireland's first known lesbian couple centuries before it was decriminalised. 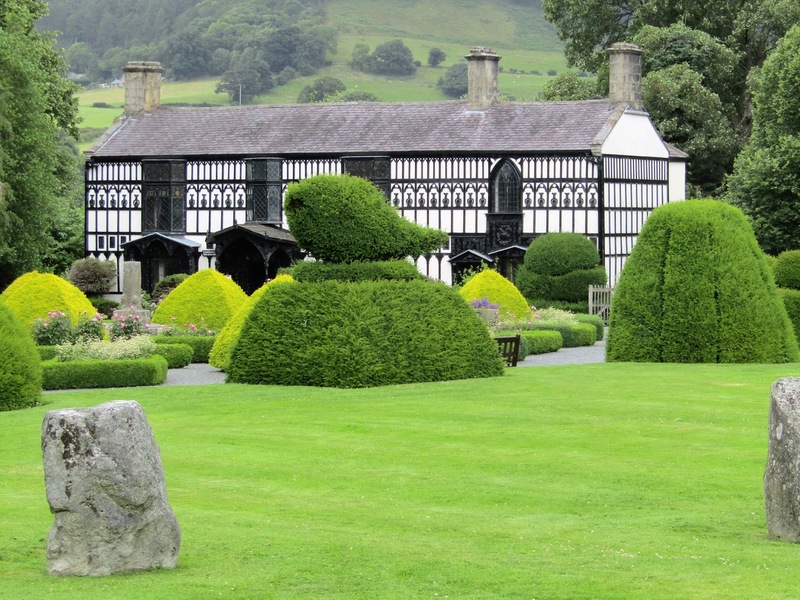 “The Ladies of Llangollen - Eleanor Butler and Sarah Ponsonby, two upper-class women from Kilkenny - scandalised society and had to elope to Wales in 1778. “Eleanor was the youngest daughter of the Earl of Ormonde of Kilkenny Castle. She was said to be clever, bookish and satirical but at 39, was viewed as a spinster. “Her family considered putting her in a nunnery. Some 28 kms away, at the mansion of Woodstock House and gardens, Sarah Ponsonby, a 23-year-old orphan, was fending off the unwanted attentions of Sir William Fownes, her married middle-aged guardian. "His wife, Betty, whose health was deteriorating, was loved by Sarah. However, William was over-eager in his hope to take Sarah as his second wife, leading her to flee with Eleanor. “The pair met after Eleanor was asked by both families to mind Sarah, who was attending Miss Parke's School close to Kilkenny Castle in 1768. “Both women felt trapped in an unbearable situation. Clandestine correspondence led to their decision to elope to Wales together. “Dressed as men and travelling by horse, they rode overnight to Waterford. But luck was not on their side, as their boat did not sail, and the pair were forced to hide in a barn. They were caught and taken home. Sarah fell seriously ill with a fever, but Eleanor, faced with incarceration in a French convent, ran away again - to hide in Sarah's bedroom. “When this was discovered, the Ormondes refused to collect their daughter and the Fownes family caved in. Sarah and Eleanor were free to go. “Living first in a rented home in the village of Llangollen, they moved in 1780 to a small cottage that they called Plas Newydd or "new mansion". They developed their home in the Gothic style with Welsh oak panelling, pointed arches, stained glass windows, and an extensive library, in which they received guests. “Mealy auctioneers are holding an auction on July 10 and 11, and selling a vase detailing the two ladies. George Mealy said the piece was reflective of ‘the brave women’. "Obviously the unusual curiosity piece is a great conversation starter. These two women paved the way and took a leap of faith in a time when it was taboo and became infamous at that time." The auction catalogue, which has the vase at lot number 195, describes it as: “A porcelain Group of two Ladies wearing Hunting Attire, German (Bisque) “The Ladies of Llangollen,” together with a blue two handled Vase with coloured print transfer of the “Ladies of Llangollen,” unusual and rare. The guide price is €80 – 120.